In about six weeks, I am heading off to Cambodia in South East Asia for my holiday. Holidays have felt a bit of a long time coming this year, but it’s great to be excited and still have a trip to look forward to in November. As a result, my sewing is going to get distinctly summery around here for the next few weeks, as I try and pull together my first me made holiday wardrobe. Having been to Cambodia before, I’ve learnt that function is more important than fashion, so I will be focusing on some nice breezy T-shirts, as well as some cool and comfy trousers and maybe some kind of pull on dress for the pool/beach. 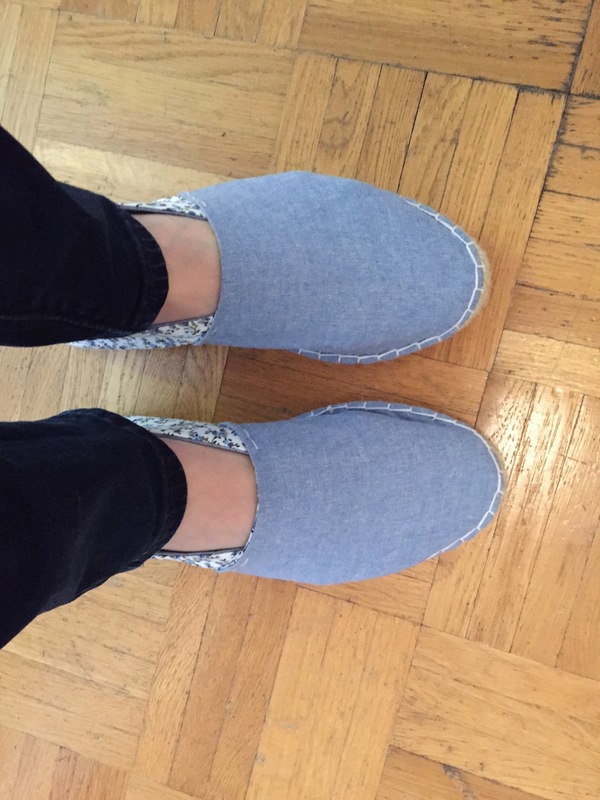 As most of my Cambodian outfits feature denim shorts, I thought a great option would be to make some super fun and comfortable espadrilles to pair with them! You can buy the pattern and espadrille soles direct from Prym or any number of stockists in the UK, America and Germany. I was quite surprised to discover that they really aren’t difficult to get hold of. The box includes one pair of soles and a paper pattern. The pattern does not include seam allowances so you need to remember to add them on! (I will still never understand why pattern companies do this, ho hum). You then just need to pick out a fabric for your espadrilles and the fun can begin. 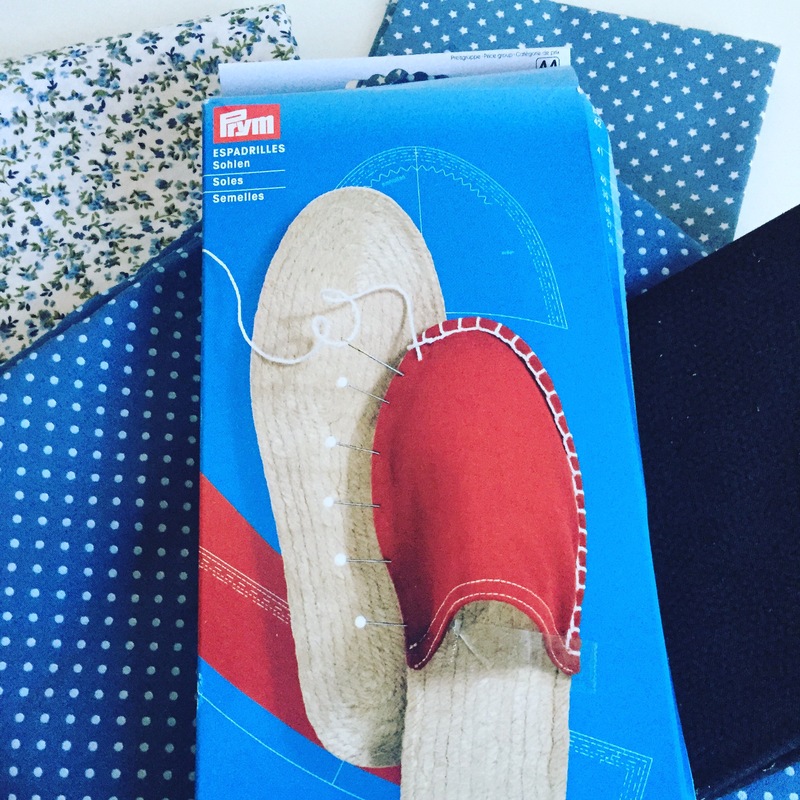 Choosing the fabric was quite difficult for me – there were so many options I could have used in my stash and espadrilles are a great scrap buster project. In the end I settled for some left over scraps from my Chambray Bettine and a cute white and blue floral fat quarter as contrast which has been hanging around waiting for the right project for a while. Really though you could make these in practically any fabric and they would look great – you can really let your creativity run wild. I also decided to interface my fabric pieces, just to give the shoes more shape and stability. After cutting and sewing the fabric pieces together with a sewing machine, you just turn them out and pin them on the shoe. This can be a bit fiddly, but is fine once you get going. You need to pin at an angle so that the pins just glide in to the sole and don’t pierce the rubber bottom. As you can see from the photo, my initial plan was to go fully denim. I had a last minute change of heart though and decided to go all out with the contrast on the outside. What’s the point of making your own shoes if you can’t be a bit wild right?! Once everything is pinned in place, it’s just a case of sewing the cotton uppers to the soles. You do this using a blanket stitch, which is probably the trickiest bit to get right. Once you get going though, it’s really easy. I found this YouTube video from The Makery really really useful. 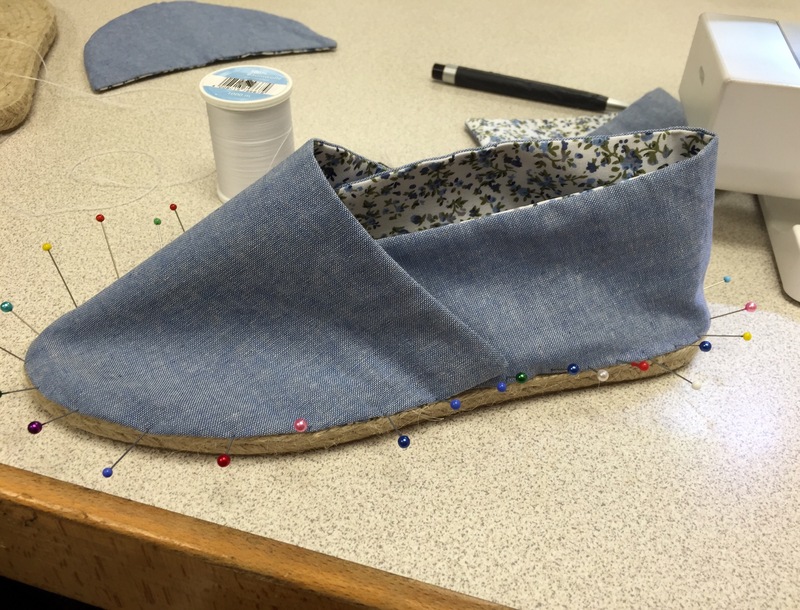 The video guides you through the whole process of making the espadrilles from start to finish and has some really handy hints for hiding the knots in the soles, changing threads, and keeping your tension right in blanket stitch. If you plan to make your own espadrilles, don’t start without watching the video first! 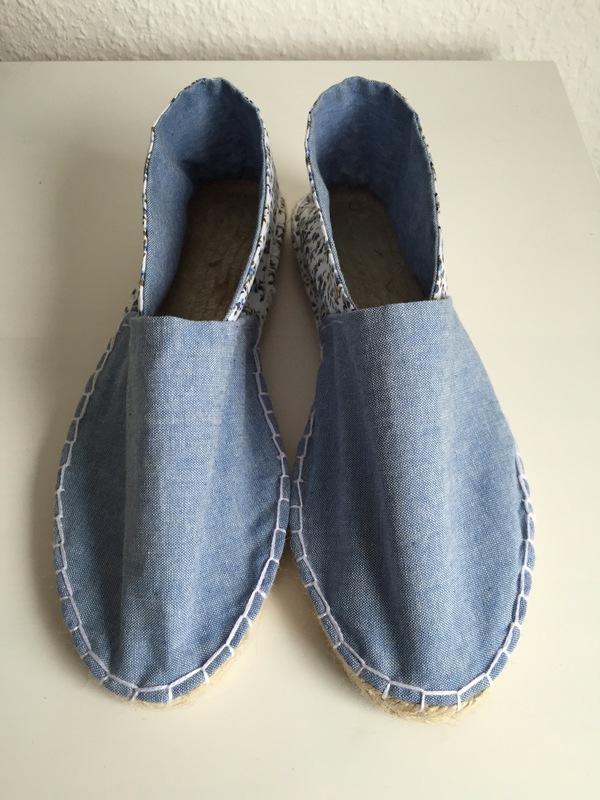 So here they are – the finished espadrilles! I’m really pleased with them. I decided to use quite a chunky white thread and make a bit of a feature of the stitching and I really like the effect. The jury is out and there are many opinions on how to finish the side stitching of the uppers. I just went with running stitch, as per the Makery Video, but blanket stitch is also an option! Here’s the finished product on my feet! I love wearing them, they are surprisingly comfortable. I can’t wait to wear them in Cambodia! I have a sneaking feeling next spring I might be making another pair of these – it’s like wearing your slippers outside! All in all a great make and something a bit different! A good opportunity to practice my normally terrible hand sewing too! Thank you Sarah Kate! It looks like Guthrie Ghani have the soles on sale at the moment if you are considering taking the plunge! My partner is half Cambodian and his parents live there – it is such a beautiful country! I can’t wait to get my espadrille bedecked toes over there! Oh, that is so cool! You made your own shoes! 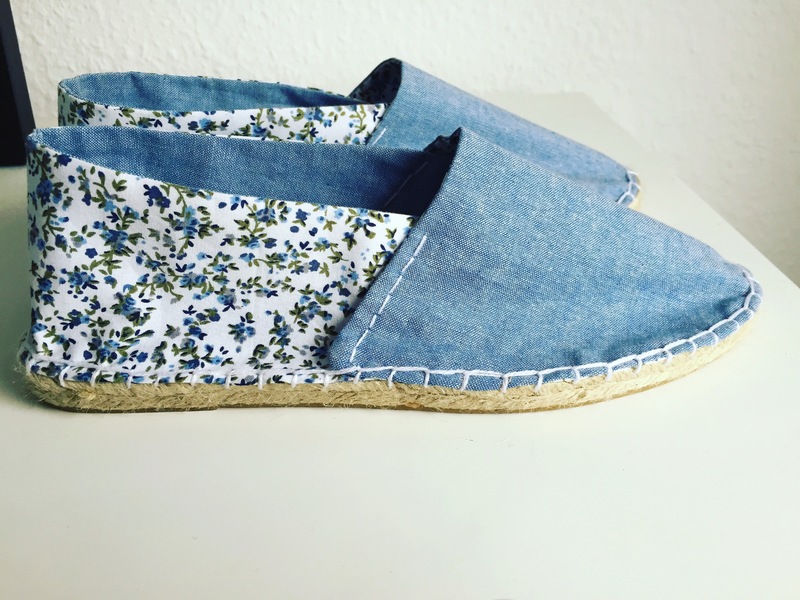 (I kind of want to go out and buy espadrille soles immediately so that I can make shoes too …) They look great, I love how you contrasted the denim and the floral fabric. Haha thank you!! If you want to go out and buy some, it looks like they are on sale at a few UK suppliers right now! I’m wondering if I should stock up – how many pairs of espadrilles is too many?! 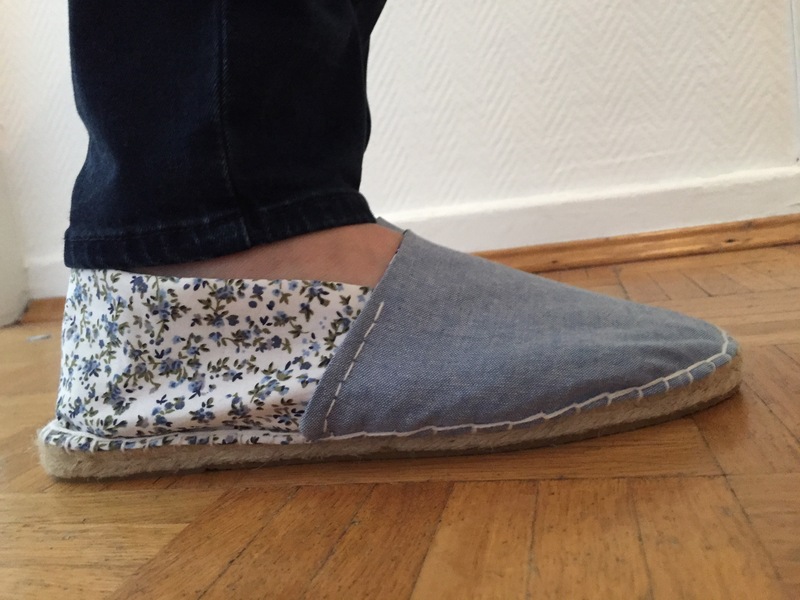 I made some espadrilles a while ago – do you find they stay on your feet OK? I put some elastic between the fabric layers to make them a bit more snug (a tip from Lauren at G & G). Yours look great, especially with the contrasting fabric. Thank you!! I was quite surprised that they do stay on as I didn’t follow Lauren’s tip. I was planning to when I realized she cleverly put the elastic between the two layers of fabric and I’d already sewn mine up so it was too late! I’m wondering if they are helped by the interfacing I used … I will see whether they continue to stay on over time and report back! Thank you! I think they’re right up there on my all time favourite makes list! A very educational and entertaining post! congratulations on your blog!